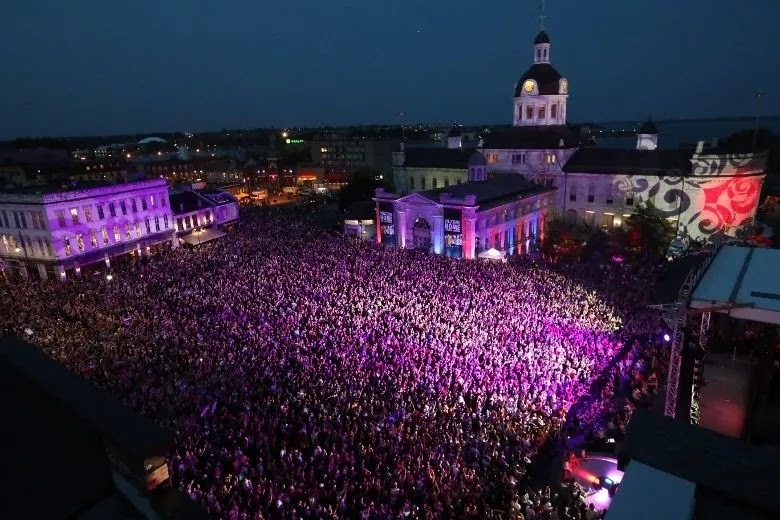 The Tragically Hip concert is now in the history books and I wonder how many people in Canada, and beyond the borders, were watching. I'll bet that a record was broken. The announcer said that 6,000 people attended the show at the K-Rock Center in Kingston - and that another 25,000 had gathered at the Market Square to watch on the big screen. I couldn't help but wonder where everyone parked? I remember going to the Market on a Saturday morning and that there was nothing close by. You had to park a block or two away, and that was just for the Farmer's Market. I'm betting that few were complaining, however. I haven't followed the band too closely over the years and tonight was the first time I've seen them perform. Kudos to the CBC for the excellent coverage - and NO commercials. It was a powerful and moving show and the crowd let the Hip know how much they were loved. With very few short breaks of only a couple of minutes, the band played for almost 3 hours. That's stamina! The main focus of tonight's show was obviously Gord Downie, because, if it wasn't for his devastating diagnosis of terminal brain cancer, tonight wouldn't have happened. If you didn't know about his health issue, you wouldn't have known it from his performance. He had moments near the end when you could tell that the finality of performing was upsetting, but if you didn't know the reason, you might have just blamed the heat and humidity. There were funny moments, too. One that I liked, as a knitter in particular, was seeing him tying tube socks around his neck to keep his neck warm and to help his voice. Be careful singers. The next thing you know, some knitter will start a "knit tube socks for singers" campaign and you could be the recipient! Gord's are obviously colorful ones from a store. A new fad in the making, perhaps? Picture taken from TV coverage w/cell phone. The line that cracked me up was near the end when Gord said that the band was going to go in the back and pretend not to come out, but will do so when everyone is cheering for them. As it turned out, there were 3 encores and then the show reluctantly ended. Even Prime Minister Justin Trudeau was there, looking like just another member of the audience in his Tragically Hip t-shirt. I wonder how he managed to get tickets? LOL Sometimes it's good to be P.M.
One more thing that impressed me greatly was the band. What talented musicians each one of them is. I could listen to any one of them again, gladly. Loved the slide guitar playing by Rob Baker, in particular, but all of these guys rock. Okay, off to knit some tube socks. Just kidding! By the way... if you're in the Kingston area, the Limestone City Blues Festival starts on Thursday. I've been a few times and there is wonderful music all over the downtown Kingston area. I highly recommend it. Hope you're starting to feel better now.